Recently, President of India appointed 15th Finance commission under the chairmanship of NK Singh. For every five years, president of India appoints Finance commission under Article 280 of the constitution. The main function of finance commission is to define financial relations between centre and states. A judge of high court or one qualified to be appointed as judge of high court. A person who has specialised knowledge of finance and accounts of the government. A person who has wider knowledge in economics. To study payment of compensation for possible loss of revenues for 5 years. It also considers proposing measurable performance-based incentives for states. First Finance Commission was set up 1951 under the Chairmanship of K C Neogy. Till now 14th Finance commissions were appointed. Recently 15th commission is appointed under the chairmanship of NK Singh. To recommend the distribution of the net proceeds of taxes to be shared between the Centre and the states, and the allocation between the states of the respective shares of such proceeds. To recommend the principles that should govern the grants in aid from the centre to the state out of the Consolidated Fund of India. The also recommends the measures to increase the resources of states and ways to distribute the resources of panchayats and municipalities. Any other matter referred to it by the president. The recommendations made by the Finance Commission are not binding on the government. Finance commission has only advisory role. In practice, the recommendations of Finance Commission are accepted by the Government of India for the distribution of shared tax revenue, as well as for grant in aid. Recently president of India constituted 15th Finance commission. The commission will make recommendations, by October 2019, for five years commencing April 1, 2020.
Who is the Chairman of 15th Finance commission? YV Reddy is 14th Finance commission chairman. Which of the following is constitutional body? 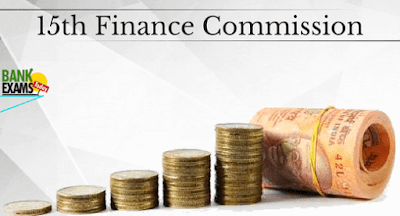 Which of the following article deals with Finance commission?